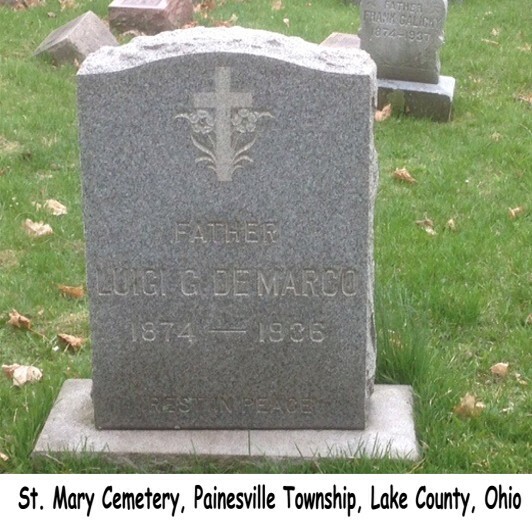 Luigi DeMarco first appears in the Painesville, Ohio, area in 1931. 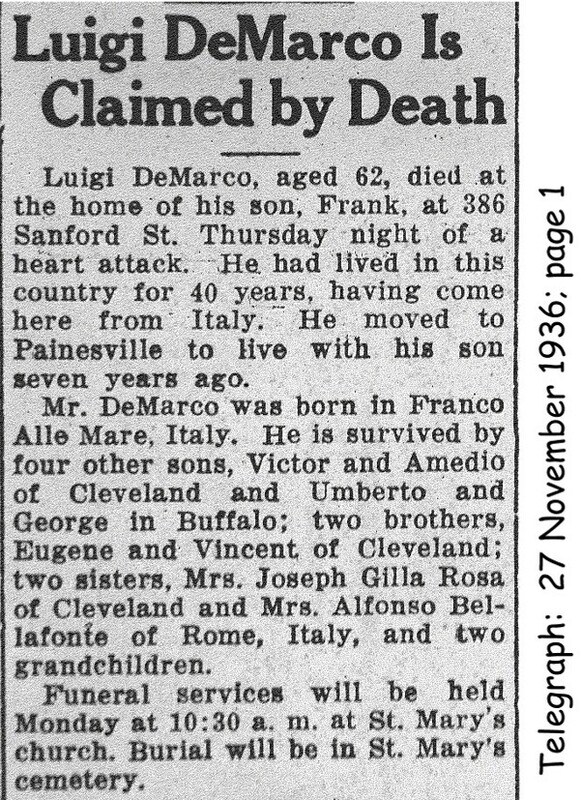 He was living with his son, Francesco DeMarco. Luigi DeMarco, son of Francesco DeMarco, was born on June 23, 1874, at Francavilla al Mare, Chieti Province, Abruzzo, Italy. He married Francesca Pantalone. 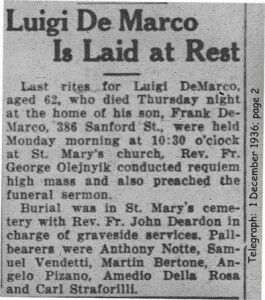 Luigi died on November 26, 1936, at 386 Sanford Street, Painesville, Lake County, Ohio, at age 62, of acute myocarditis. His body was interred at Saint Mary Cemetery at Painesville Township, Lake County, Ohio. Luigi DeMarco emigrated from port of Naples, Napoli Province, Campania, Italy, on May 31, 1909, aboard the ship S.S. Indiana. Luigi DeMarco’s final destination was London, Ontario Province, Canada. He was returning to Canada where he had lived from 1907 to 1909. On June 14, 1909, Luigi’s wife, Francesca Pantalone, and his four sons, join him in Canada. 1. Francesco DeMarco was born on July 7, 1899, at Francavilla al Mare, Chieti Province, Abruzzo, Italy. Francesco married Mabel Thomas. 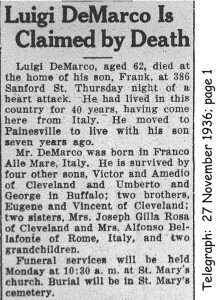 Francesco DeMarco died on October 31, 1955, at his home, 3133 North 33rd Street, Phoenix, Maricopa County, Arizona, at age 56. His body was interred at St. Agnes Cemetery, Phoenix, Maricopa County, Arizona. 3. Umberto DeMarco was born on February 20, 1905, at Francavilla al Mare, Chieti Province, Abruzzo, Italy. Umberto DeMarco died in March, 1984, at age 79. 4. Amedeo DeMarco was born on January 22, 1907, at Francavilla al Mare, Chieti Province, Abruzzo, Italy. 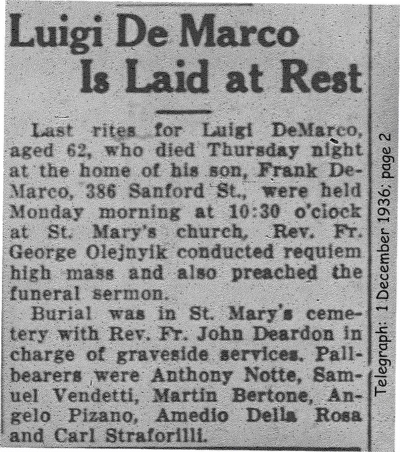 Amedeo DeMarco died in January, 1982.